If a society is going to be resilient – if it’s going to be prepared to deal successfully with the challenges that await it – it has to invest in its future. And while this advice doesn’t tend to strike anyone as off base, many governments regularly ignore it. The United States, my home country, is a prime example. While staring into the looming abyss of rising deficits, climate change, and aging power grids, Americans and their elected representatives are focused on feel-good policies. The benefits of what could be gained a decade down the road by making some financial sacrifices are being overlooked in favor of options like tax cuts and looser regulations that, though boding ill for future well-being, will make many happier in the here and now. The root of the problem isn’t new. Recent Nobel Laureate Richard Thaler pointed it out several years back when he opined that “Congress has self-control problems.” It’s not really a surprising flaw, though, as it’s one most people share. We tend to want what we want now; we’re not usually itching to sacrifice immediate pleasures for later rewards. Given this state of affairs, the question isn’t whether self-control is important – it certainly is – but rather how to encourage it. And here, the answer you’d get from most psychologists and behavioral economists would be a simple one: willpower. People just need to tamp down any impulses for pleasure in the moment that are likely to hinder long-term success. Yet for all its seeming simplicity, this strategy doesn’t often work. If using willpower to boost self-control were truly effective, 25% of New Year’s resolutions wouldn’t be broken by the second week of January. Neither would people fail about one out of every 5 times they try to resist a temptation to overspend, overeat, or the like. Willpower isn’t reliable; it’s a fragile tool at best. Yet even if willpower could somehow be strengthened, it wouldn’t solve the problem. There’d still be a rational reason why people might refrain from even trying to use it: one person’s earnest efforts to ensure a better world won’t amount to anything if her neighbors refuse to do the same. Why should you pay your fair share of taxes, or vote for representatives who will raise them, to address societal needs if you think most other people will use loopholes or cheat the system? Why should you reduce your power usage if you think most people won’t bother turning off their lights? Simply put: why should you sacrifice when no one else will? Nobody wants to be a sucker when others are free-riding off their contributions. Finding a solution in this case requires identifying a different type of self-control tool – one that not only encourages people to value the future more than the present, but also to behave in more trustworthy and generous ways. Fortunately, we all possess a tool that works just this way. The problem is we’re neglecting it. What motivates people to accept sacrifice or persevere in the face of difficulty? To return a favour or to extend one? To work hard to develop a skill or a positive reputation? While it can be what they think, it’s more often what they feel. Moral emotions – ones like gratitude, compassion, and an authentic sense of pride (as opposed to hubris) – generate such virtuous actions. We pay people back because we feel grateful; we offer to help them because we feel compassion; we work hard to achieve a goal because we take pride in the result and the admiration of others. What unites these behaviors and many like them is the necessity of self-control. Each requires a willingness to sacrifice time, money, effort, or even happiness in the moment in order to build and maintain stable, productive, and supportive relationships that will benefit a person for years to come. One way that moral emotions increase self-control is by combatting the mind’s tendency to discount the value of future rewards. To demonstrate the point, we conducted an experiment in which we had people answer a series of questions of the form: “Would you rather have $X now or $Y in Z days?” where Y was always greater than X, and Z varied over weeks to months. To make the consequences real, we told participants we’d pick one of the questions at random and honor their answer. So, if a person said he’d prefer $35 now rather than $75 in 6 weeks, we’d hand him $35. If he chose the latter option, we’d send a check for $75 at the designated time. Right before people answered these questions, however, we had them describe an event that evoked gratitude, happiness, or a neutral feeling. 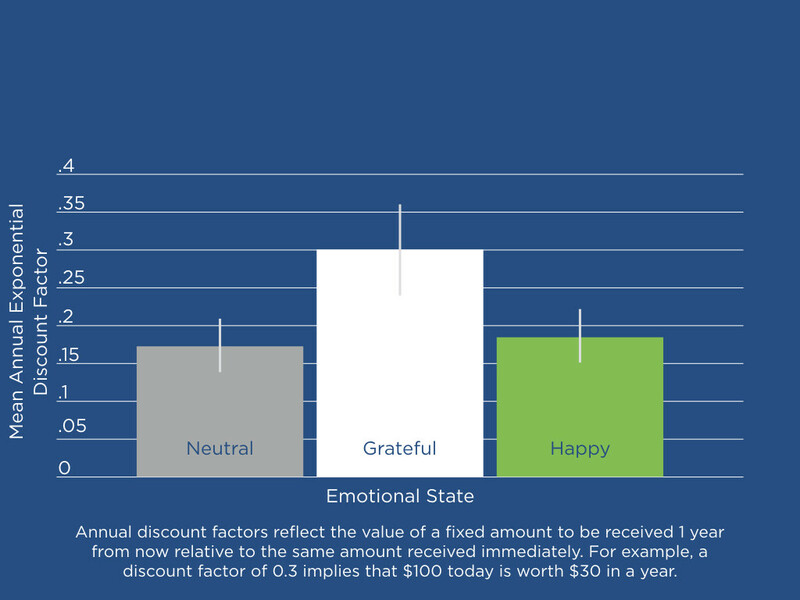 As we anticipated, those who felt grateful discounted the value of future rewards to a lesser extent (see Figure). In comparison, people feeling neutral or happy viewed $100 in the present as equal to $17 in a year, (meaning they’d forgo the opportunity to receive $100 in a year if they could get $17 today). Grateful people showed double the self-control. They were much more willing to wait for larger future gains. Pride works the same way. And because it increases the value people place on the future, we’ve found it makes them more willing to persevere toward valued goals. For example, when we made people feel proud of their performance on a difficult task, they subsequently devoted 40% more time to hone abilities related to it even though doing so was quite trying. The second, related, way these emotions aid self-control is by making people more trustworthy and cooperative. As one example, we had people play an economic game after endowing them with four tokens. Each token was worth $1 to its owner but $2 to her partner. As part of the game, people could choose how many tokens to exchange. The fairest option would be for each player to give all her tokens to her partner, thereby allowing each to double her money. This strategy, of course, has an element of risk. For it to work, partners have to be trustworthy. Similar to the prisoner’s dilemma, a person could choose to maximize self-interest at her partner’s expense by withholding tokens while counting on the partner to give hers. What we found is that people who experienced gratitude while playing the game behaved in a much more trustworthy manner; they gave significantly more tokens to their partners than did their neutral counterparts. Pride, too, supports shared sacrifice. As one example, the Harvard economics lecturer Erez Yoleli and colleagues examined compliance with a power company’s request to attach devices to home air conditioners meant to prevent blackouts. The devices worked by raising thermostats when the electric grid was taxed, thereby preventing major power outages by reducing the demands on the grid. When decisions to install the devices were made publicly, compliance rates almost tripled, as people could see what their neighbors were doing. It’s likely that taking pride in their reputations enhanced people’s willingness to accept a small personal increase in discomfort to avoid a future, more widespread one that would affect everyone. From the standpoint of potential interventions, moral emotions are fairly effortless to use. They can be easily evoked, either regularly via habits and norms (e.g., counting “blessings,” offering approval and admiration, or in the case of compassion, by practicing mindfulness) or strategically by framing policy appeals in emotional ways (e.g., encouraging pride in green behaviors). When people feel the resulting emotions, they won’t be carefully reasoning about what to do – how much to invest to get a certain reward, how much to help someone to ensure payback – and then forcing themselves to do it. To the contrary, these emotions will make them approach a long-term benefit in the same way that a different emotion – fear – might make them avoid an immediate danger. Emotions are mental short-cuts. They automatically influence what we expect to happen and what we value. And to the extent that we and our political leaders cultivate emotions that encourage us to invest not only in the future but also in others, saving and sacrificing to ensure greater resilience should come more easily. David DeSteno is a professor of psychology at Northeastern University and author of Emotional Success: The Power of Gratitude, Compassion, and Pride (Eamon Dolan / Houghton Mifflin Harcourt).